I’m on holiday at the moment, so I dug out this old limerick from 2006. See you next week. Brilliant! It took a minute to realise it’s a limerick. Brilliant. It took me a comment to realise it’s a limerick. Thank YOU, HfB, it took reading your comment for me to realize. I’ve wondered why there wasn’t a commandment against slavery; a Jehovah’s Witless friend said that god didn’t LIKE slavery but he tolerated it. Why would god have to tolerate ANYTHING from us? He doesn’t even tolerate bacon-cheeseburgers (on Friday). If there were a commandment, “Thou shalt not text and drive” I’d believe it was more than early bronze-age babbling. Unfortunately, too many conflate the ten commandments with the ten amendments. Regulars here will maybe be familiar with Hitchen’s revised ten commandments. 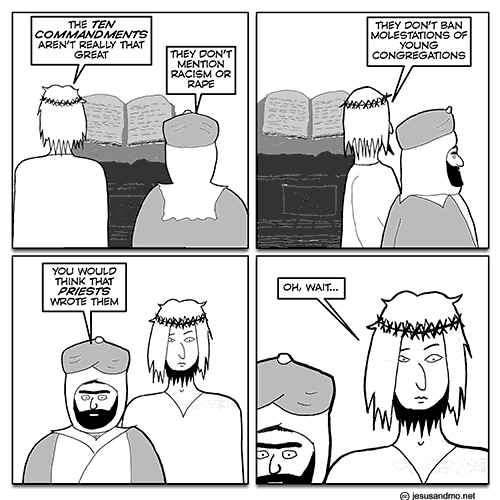 Jesus and Mo are his stolid Men. One is left with nought but Amen. It ought to be “congregants”, but that doesn’t rhyme. It now occurs to me that I could have written all the above as a limerick, but that would just have been showing off. I always enjoy J&M but sometimes I literally LOL. Nice one author. I thought it was going to be a rehash of an argument that’s been made many times but the punch line is a new twist (to me at least). edit – I just noticed authors note that this is from 2006. Still timely after all these years. Sadly some things never change. Whose limerick ends at line two. There was a young man from Verdun. And biology’s left high and dry! Hotrats, your last line was what I was told in my family, by my father, who called himself a “freethinker”, an old term which I think ought to have a revival. He also thought it possible that she’d been raped by a Roman, perhaps a soldier. So she’d deliver a holy descendant. Is it out of his power to prevent it? All this chat about limericks and other verse reminds me – what’s happened to Nasser Ben Houdja? This from the guy who insisted that “Till heaven and earth pass, one jot or one tittle shall in no wise pass from the law, till all be fulfilled.” (Matthew 5:18) Is the Son now critiquing his dear old Dad’s work?!? The prophecies all fallen flat. Predictions of doom are just that. While atheists smile and stand pat. Troubleshooter: good, and SO on topic (ISTM). Inspiration while going to pick up pizza! Will probably not be remembered. But we do it despite that. To faith we will not be indentured. No surprise their victims are screwed. And THAT, JoJo, is what you call an unanticipated RAMIFICATION!